A video of what appears to be HTC’s new Sense 6.0 surfaced over the weekend, giving is an idea as to what HTC has in store for the “All New HTC One” or One (2014). The video was uploaded briefly before being deleted, but since this is the internet, several copies of the clip have been re-uploaded, one of which we included for your viewing pleasure below. I don’t actually believe that this is Sense 6.0 running on the new HTC One, but rather a ROM built off of Sense 6.0 that is being ported to another HTC device. Correct me if I’m wrong, but I believe there are messages during the video of the owner having issues with the camera, something that almost always plagues ROMs in their initial state. We have already seen sounds and wallpapers leak from the One, so it wouldn’t be surprising to see Sense 6.0 ROMs pop up before the launch of the One. With that said, there is still plenty of good stuff to talk about here. While the overall look of Sense certainly hasn’t changed, you can see how HTC is trying to innovate on the software front, since well, we know that the One (2014) will be much like the One (2013) in terms of hardware design. 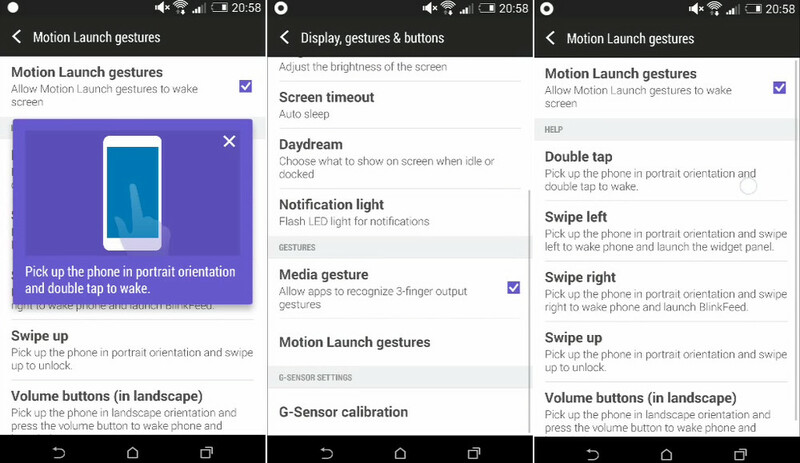 The coolest feature shown is a “Motion Launch gestures” section under “Display, gestures, and buttons.” The gestures allow you to jump straight into BlinkFeed, open up a widget panel, unlock the phone, or open the camera without ever pressing the lock/wake button. With the screen off, you simply pick up the phone, and swipe in the direction of the action you want to complete. Swipe left to get into widgets, right to get into BlinkFeed, up to unlock, or double-tap to wake. If you put the phone in landscape, you can press the volume button to launch the camera. 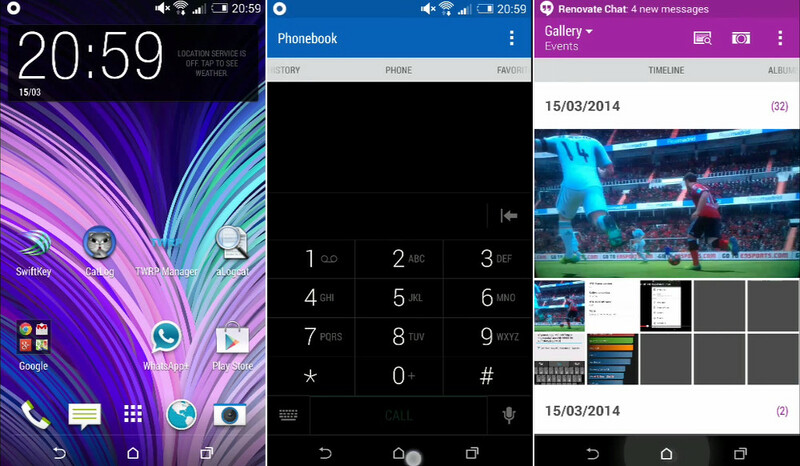 These gestures remind me of Motorola’s take on software enhancements. Rather than giving you a bunch of 1-time use features like we saw during last year’s Galaxy S4 launch, HTC is trying to give you ways to interact with your phone without much fuss. Like Active Display, I can see these new gestures really coming in handy. We are also seeing a button to turn off BoomSound, a restyled gallery, purple accents throughout, a new darkened dialer, and a couple of new HTC apps. Check out the video below, and let us know what you think.